Cucumber relish.The cucumber extravaganza continues! We have SO many pickles now, both dill and bread and butter, and frankly, I'm sick of making them. I needed to do something a little different, so I chose to make some relish. It was surprisingly uncomplicated and easy, thanks to my handy dandy food processor (I can't and don't want to imagine doing all the chopping by hand)(we're so spoiled these days, aren't we!?!). This is perfect for topping hot dogs, something we have often in the summer. It's also a great addition to potato salad and it complements pork tenderloin beautifully. Now that I know how simple it is to make, I'm wishing I had several jars of relish in the pantry instead of jar after jar of pickles! Combine prepared green pepper, pickling cucumber, and onion in a large stainless steel (or enamel-coated) pot. Stir in one cup of vinegar and bring to a simmer. Simmer, stirring occasionally, until the vegetables have cooked down and the liquid is reduced by about 1/3, about 30 minutes. Drain the vegetables, discard the liquid, and return the vegetables to the pot. Add the remaining vinegar, sugar, and spices. Bring to a simmer and cook for five minutes, then remove the pot from the heat. Fill your sterilized jars, wipe the rims, and apply lids and rings. Process in a boiling water canner for 10 minutes (starting time when pot returns to a boil). Remove jars from pot and let cool on a towel-lined counter. I add relish to my tuna fish instead of chopping pickles. We are indeed spoiled by our technology. Your relish looks wonderful! I love canning and this relish looks perfect!! So yummy! Yum! I wish I had both--pickles and relish. I'd love to spend time finding new and different ways to them all! Why have I never thought of making relish? What a great idea! I just made dill pickles but have never made relish. Yours sounds great and I'm wondering why I never thought of that. Thanks! This is such a great colour and it sounds delicious! I can imagine it being used with all sorts of meals. Working with a food processor certainly makes work easier. I have made a relish in my kitchen multiple times and every time I had loved it. But I had never tried to make it with cucumbers. Thanks for the recipe. Your garden must have done very well! What will we do with all our free time once the veggies are done growing?! 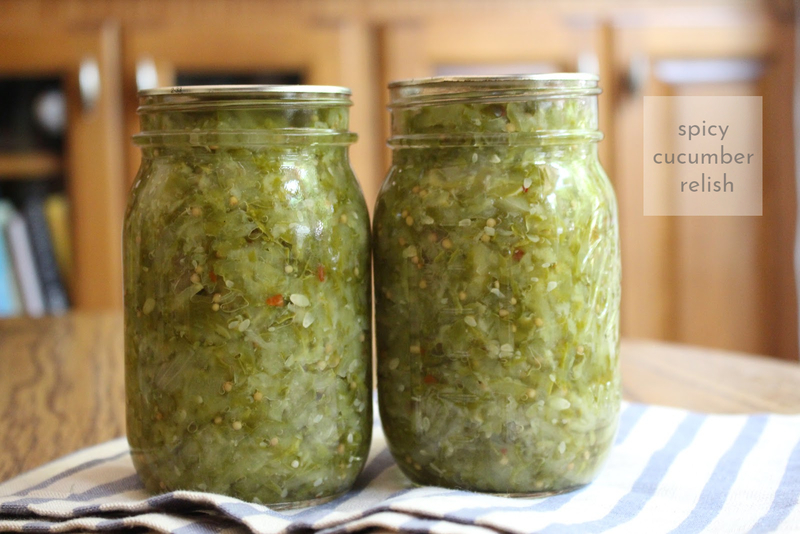 Now I'm craving a hot dog with some of this wonderful looking cucumber relish! This looks so good, Grace! I made relish last year when I got tired of making pickles so I totally get it. I had a tartar sauce recipe that used pickle relish which made it even easier to justify. Hmm, reminds me I need to try that recipe.